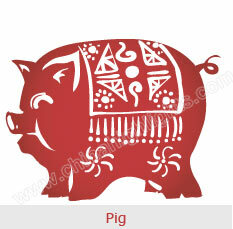 Chinese New Year 2019 begins a Pig year. 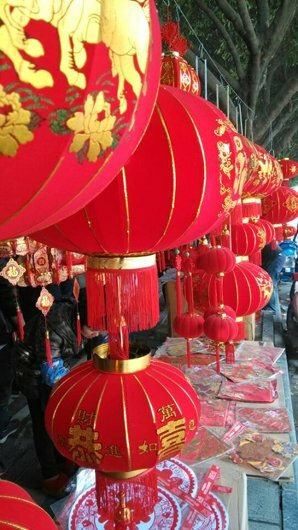 Chinese New Year’s Day marks the beginning of the Spring Festival holiday (春节, Chūn Jié), which is the biggest holiday in China. Hong Kong&apos;s Chinese New Year festival is world famous. In Hong Kong, people mark the occasion with a unique fusion of modern fun and ancient customs. The three days comprising a night parade, spectacular fireworks, and horse racing often make it to the top of world festival event lists. Tickets for seats range from about 300 HKD to 480 HKD per person. It is free if you view the parade from the street. The Chinese New Year Night Parade is one of the most popular events for the Hong Kong Chinese New Year celebrations. It attracts tens of thousands of visitors to enjoy the colorful parade each year. Crowds line the streets and make way for the parade in the Tsim Sha Tsui area near Victoria Harbour. 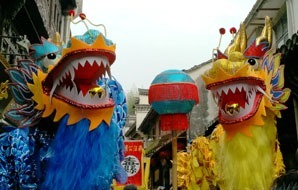 You can see dozens of colorful floats, lively dragons, traditional Chinese dancers, and bands. The parade route proceeds along the historic Nathan Road, Salisbury Road, Canton Road, and Haiphong Road. It goes past some Hong Kong highlights, such as the Avenue of Stars, Kowloon Park, and the Golden Mile of Nathan Road. The night parade begins at 8pm but pre-parade street performances usually begin at 6pm. You’d better arrive early to get a good spot. Before the parade, you could tour the attractions, go shopping, and dine out. Hong Kong&apos;s biggest mall, Harbour City, is open along the parade route. The Temple Street Night Market pedestrian street is a place to browse for bargains and to snack or have a meal beforehand. Read more about the International Performance Night 2019 and the parade program. Victoria Harbor blazes with fireworks, while the lights dance on the buildings. 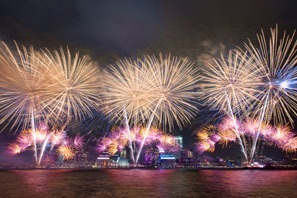 On the second day of the Spring Festival, Victoria Harbour is scheduled to roar with a giant firework display with choreographed pyrotechnics. The show is set to last for about 25 minutes. It usually coincides with the daily record-setting Symphony of Lights with its colorful building lights and laser light show. The best places to view the display are both sides of the harbor front in Tsim Sha Tsui, Central, Wan Chai, by boat on the water, or from The Peak. A more enjoyable and less-crowded way is to reserve a spot at a restaurant or bar, or sit in a hotel room with a harbor view. Read about the Chinese New Year’s Eve Fireworks including locations and transportation. Known as the most popular races of all, 100,000 excited fans crowd into Sha Tin Racecourse on the third day of the holidays. The Chinese New Year races are a special event. This has always been Hong Kong&apos;s most popular horse racing event. On this unique race day, the Hong Kong Jockey Club (a nonprofit charity group) features a full program of traditional and colorful festivities. There is a grand opening show as well as cultural performances and entertainment. The featured race is the Chinese New Year Cup. 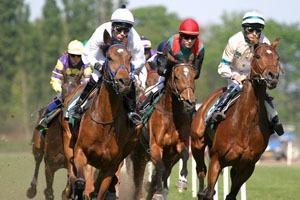 Read more on the Hong Kong horse racing season. Crowds go shopping in Hong Kong before and during the Spring Festival for holiday food, decorations, clothes, gifts, and furniture. Promotions, discounts, and entertainment help make holiday sales skyrocket. Malls stay open and even extend hours for the shopping rush during Chinese New Year&apos;s Eve and the important first few days of the Chinese New Year. But small market street shops may close for a couple of days or close early. What makes the Hong Kong Chinese New Year festivities different to those of mainland China isn&apos;t only the festival horse racing tradition and the luxurious shopping, it is the Hong Kong and Macau tradition of decorating items with flowers and plants, and also giving them as gifts. In Hong Kong and Macau, a lot of significance is attached to this custom, and the various kinds of flowers or plants that are given as gifts denote different wishes or signs and give good luck. 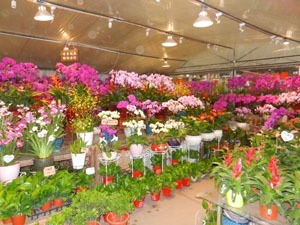 Learn more about the Chinese New Year&apos;s Eve Flower Market Rush 2019. 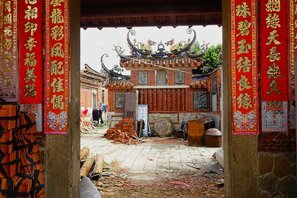 It is a long-established tradition for locals to go to Lam Tsuen in the New Territories to pray for good luck during the Chinese New Year period. It is a colorful festival where you can experience many unique traditions and events, such as well-wishing at the wishing trees, releasing of the wishing lanterns, and seeing the floats and performance groups from the Chinese New Year Night Parade. The carnival lasts for a couple of weeks from February 5th to 19th, 2019. During the Spring Lantern Festival, which marks the end of the Chinese New Year, Hong Kong will be decorated with thousands of colorful lanterns. It is a tradition to hold a lantern carnival at Tsim Sha Tsui at the Hong Kong Cultural Centre Piazza. 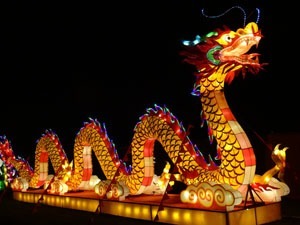 Apart from lantern displays, you can see some performances, such as acrobatics, folk songs, and dances, and cultural activities, such as lantern making. 1. 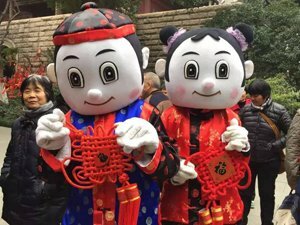 The first three days of the Spring Festival are a prime time to tour Hong Kong if you are interested in experiencing the celebrations as mentioned above. 2. The Spring Festival is by far the heaviest travel period in China. This peak travel time starts about a week before New Year’s Day. Get your tickets early – weeks or months beforehand – since people snap up transportation for these dates. Demand is very high for international flight tickets and train tickets. 3. Chinese businesses, restaurants, and stores traditionally close for several days starting from the evening of Chinese New Year&apos;s Eve. 4. Unless you are interested in experiencing the holidays, it would be better to see Hong Kong at a less busy time. Travel is easier, and accommodations and meals cost less. Hong Kong is often warm at Chinese New Year! Chinese New Year Parade (reserved seats). Please contact us if you want to know information about this tour. 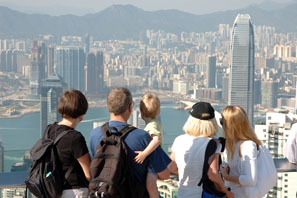 Hong Kong Half-Day Tour: Tour Hong Kong for shopping and sightseeing during the big festival. 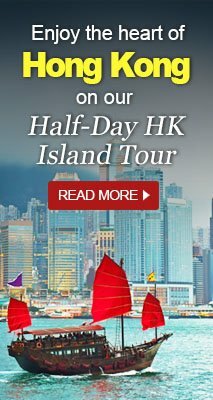 You can create your own dream trip: Tailor-make your own Chinese New Year tour to visit the places you want in Hong Kong and China.